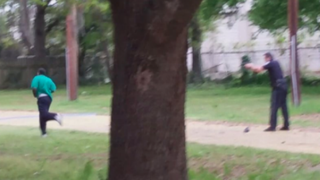 Video screenshot shows then-Police Officer Michael Slager with his gun drawn as Walter Scott ran from him April 4, 2015, in North Charleston, S.C.
City officials in North Charleston, S.C., have agreed to a $6.5 million settlement with the family of Walter Scott, the unarmed African-American man who was shot in the back by a white police officer who is now facing murder charges. According to USA Today, the City Council approved the amount Thursday after months of negotiations with Scott's family. On April 4, Scott was pulled over by Officer Michael Slager for driving with a broken taillight. During the stop, Scott ran from the car and the officer gave chase. A bystander captured the incident on video, which shows Slager shooting Scott as he was running away from the officer. Scott suffered multiple gunshot wounds and died on the scene. Video of the shooting was released and spread across social media. "I am glad the city and the family were able to reach a settlement without the necessity of a lawsuit," North Charleston Mayor R. Keith Summey said, USA Today reports. "Both sides have met many times and worked very hard over the past several months to resolve this matter." Slager was charged with murder and remains in custody. "As a result of this tragedy, important issues have been discussed not only in North Charleston but around the country," Summey said, according to USA Today. "Citizens have become engaged in the process and government officials are listening." Scott's family added that they are pleased with the settlement and are ready to shift their focus toward making sure that Slager gets convicted of murder. "While nothing can replace having Walter in our lives, the city of North Charleston's historic actions ensure that he did not die in vain," Anthony Scott, Walter Scott's brother, said. "This city sent a message, loud and clear, that this kind of reckless behavior exhibited by members of law enforcement will not and shall not be tolerated," he said.